It is astonishing that so many intelligent people could seriously espouse such an obvious falsehood. Do they really believe that Sunni Muslims and Shi'ite Muslims -- whose views on Israel are identical -- are slaughtering each other in Iraq because of the Israeli-Palestinian conflict? Or that anti-Syrian politicians in Lebanon -- who are no less anti-Israel than the pro-Syrian sort -- are being assassinated by Syria and threatened with a coup by Hizbullah because of the Israeli-Palestinian conflict? That Muslims worldwide rioted over Danish cartoons because of the Israeli-Palestinian conflict? The list could go on for pages. . . . But, in fact, history teaches the opposite: Just as Hitler, far from being appeased by the West's handover of Czechoslovakia, instead concluded that he could also grab Poland with impunity, thereby igniting World War II, so has every concession to Muslim terror simply encouraged Muslims to think that violence pays. Israel's pullout from Gaza, which 84 percent of Palestinians attributed to terror, was a major factor in both their election of Hamas, the leading Palestinian terrorist organization, and their ongoing majority support for terrorism. Spain's pullout from Iraq following the Madrid bombing encouraged al-Qaida to plan similar bombings in other countries. And Muslims worldwide credit Iraqi terror with America's expected pullout from Iraq. If the West really wants to solve its Muslim problem, it must adopt the opposite approach -- making it clear that violence, far from being rewarded, will be penalized. By instead seeking to appease the Muslim world in Israeli coin, it merely proves that violence pays. And it will thereby reap more of the same. If Hamas is seriously talking of a truce, was that slight change in attitude because we "engaged" them and continued material aid, or because we cut funds, they are near broke, and isolated from their erstwhile international supporters? And did Syria leave Lebanon because American diplomats went to Damascus, as in the past, with more talking points? And did Iran finally become the focus of the Security Council because America dialogued with Teheran? And why did all those years of engaging Khadafi suddenly come to fruition circa 2003? I don't think shuttles back and forth, special envoys, and one-on-one summits -- for all the American weariness with Iraq and the desire for calm -- will do much to change the behavior of either Syria or Iran, when their present posture surely furthers their own national interests and agendas. Here’s how the Iraq Study Group should approach its task (and if it doesn't, how GWB should proceed): What Would Winston Churchill Do? Underneath this new liberal internationalism is a cluster of mistaken assumptions . . . the idea that the Bush administration has been hands off in Israel (not really), the idea that the Bush administration has been unilateral (insulting), and the idea that there are allies out there just waiting to join us in the global war against Muslim extremism (demographically problematic for them, to say the least). It's an ideologically and institutionally myopic.
. . . [Marshall’s] . . . wrong because the starting assumptions are wrong -- there is no difference between failing to get the Palestinians to genuinely make peace and never starting in the first place. Or actually, there is a difference -- but it doesn't end up positively for the people who brought Arafat to the White House. But Allen Roth and David Goder [of One Jerusalem] are quite right in bringing center-right pro-Western bloggers into dialogue with people like Will Marshall. The stakes in the war against political Islam are too high to let partisanship get in the way either of fruitful intellectual dialogue or of contingent political alliances. . . . Will Marshall and his allies on the center-left are fighting the good fight against isolationists and neo-Realists of all stripes. They're frighteningly wrong in some respects, but they remain critical to constructing a centrist coalition dedicated to protecting the West against the threat of jihadism.
. . . And if the center-left arguments can’t be addressed and answered (and we want to be very clear on this -- we think they can be) -- then they should be adopted. Because that’s how useful strategies and political visions are formed. “It is 1938; Iran is Germany; and it is racing to acquire nuclear weapons.” Benjamin Netanyahu repeatedly punctuated his speech in Los Angeles earlier this month with that sentence. It was an effective rhetorical device, conveying both a sense of threat and a sense of urgency. But 1938 may be relevant in more ways than as a rhetorical device. Revisiting that year, through Winston Churchill’s compelling account in “The Gathering Storm,” is an instructive exercise, and one the Iraq Study Group might consider as it completes its deliberations. . . .
. . . But instead of seeing this remarkable convergence as a sign that these observers may be on to something, Mr. Podhoretz insists that the Bush Doctrine is alive and well. His refusal to allow pesky facts to get in the way of a good argument is akin to Bush’s own stubborn determination to talk as if his policies were on track even though reality clearly suggests otherwise. Well, the answer is that I have learned from experience that the more a given idea gets to be accepted as a self-evident truth by my fellow intellectuals, the more likely it is to be wrong. To be specific: about 35 years ago, there was a similarly broad consensus, also confident that it was perfectly in tune with “reality,” on the idea that the Soviet Union had become a “status-quo power,” and that World War III (more commonly known as the cold war) was now over . . . . Those few of us who took issue with this “remarkable convergence” were almost universally derided as delusional and denounced as dangerous warmongers, but we turned out to be right. The same thing happened with the Oslo Accords, whose promise of peace between Israel and the Palestinians was embraced by an even larger “herd of independent minds.” Here again, those few of us who argued that Oslo would lead not to peace but to another war were derided and denounced, only to be (unhappily) vindicated by the second intifada. . .
As Mr. Gordon’s account of the “price” being paid [in Iraq] reveals, this idea [that the Bush Doctrine is dead] is based almost entirely on the fact that the forces opposed to the Bush Doctrine are (mirabile dictu!) fighting back. Evidently the die-hard Baathists and the sectarian militias and the jihadists and their foreign sponsors do not share in the consensus on the Bush Doctrine’s failure. For if they did agree that it is already dead, why would they be waging so desperate a campaign to defeat it? . . .
Robert W. Merry takes issue with the comparison I drew between the Truman Doctrine, of whose consequences he paints an entirely positive portrait, and the Bush Doctrine, to which he ascribes nothing but one calamity after another. But Mr. Merry neglects to mention that, in addition to the Marshall Plan and the other achievements he cites, the Truman Doctrine also produced the Korean war. Korea (which cost more than 36,000 American lives as against the fewer than 3,000 in Iraq) turned out to be at least as unpopular then as Iraq is today, and Truman’s contemporaries were just as blind to the accomplishments of his doctrine as Bush’s are to his. Yet unlikely as it would have seemed in 1952, a year in which Truman’s job-approval rating plummeted into the 20’s (fifteen points lower than Bush at his nadir), historians now rate him as a great President. I believe that the same recognition will in due course be accorded to George W. Bush. Worth reading in its entirety, as is the September article itself. Responsible people will ignore Carter’s attempt to tar and feather Israel with the word “apartheid.” . . . . But Carter has done something even worse in his book: He egregiously misstates both the relevant diplomatic history and the long-standing U.S. diplomatic position, and then he blames Israel for not complying with it -- demonizing Israel even more insidiously. 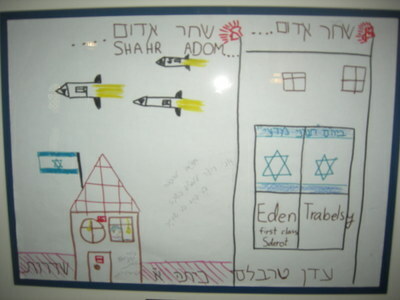 The article reviews the diplomatic history underlying UN Security Council Resolution 242, the Road Map, and the Presidential Letter of April 14, 2004 to Israel. Like Walt & Mearsheimer, Carter he is entitled to his own opinions, but not his own facts. Palestinian terrorism is virtually missing from Carter’s entire historical account . . . . The long history of Palestinian terrorism against Jews -- which began in 1929 when the Grand Mufti of Jerusalem ordered the slaughter of more than 100 rabbis, students and non-Zionist Sfardim whose families had lived in Hebron and other ancient Jewish cities for millennia . . . . [T]he long history of Palestinian terrorism before the occupation, or of the Munich massacre and others inspired by Arafat. . . . The Carter book is so filled with simple mistakes of fact and deliberate omissions that were it a brief filed in a court of law it would be struck and its author sanctioned for misleading the court. "Palestine: Peace not Apartheid" is a poorly written, poorly argued, nonsensical little book, and it's the most dangerous weapon Israel has faced in a year full of fighting. The book is, as I said, a libel. 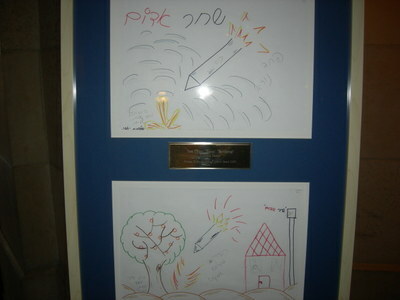 Palestinians have fired more than 1,000 rockets from Gaza into the Israeli city of Sderot so far this year; and more than 1,300 rockets since August 2005 (when the last Jew left Gaza); and more than 3,500 since 2000 (when the Palestinians began a new war after being offered a state). 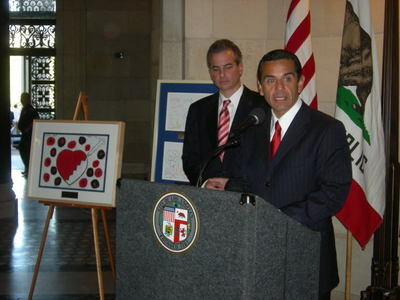 On August 2, 2006 Rabbi David Wolpe of Sinai Temple led a solidarity mission to Sderot, accompanied by Los Angeles City Councilmember Jack Weiss, Jewish Federation President John Fischel, a group of congregants numbering close to 50, and a couple of bloggers (one of them pretty prominent). 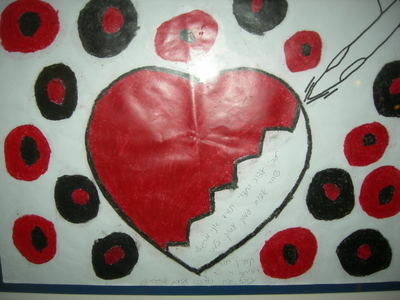 The group visited the Science Orthodox School, listened to the children and their teachers, and viewed their heartbreaking art, including Karin Hori’s. 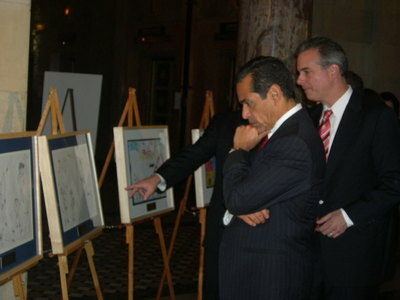 Councilmember Weiss personally carried home the drawings and had them framed, and yesterday morning they were exhibited in the City Hall Rotunda of Los Angeles, with a presentation by Mayor Antonio Villaraigosa, before a crowd that included a representative of the Israeli consulate, representatives of the Simon Wiesenthal Center, StandWithUs, Sinai Temple, the Consul Generals of France (Philippe Larrieu) and Germany (Christian Stocks), and the public. a story of pain and heartache, but also a story of resolve. In the conversation that I [just] had with Mayor Moyal [of Sderot], they expect, actually, much worse in the coming weeks and months than what they have gone through in the last six years. But these are people that are resolved, resolved that they will continue to live . . . they will not be deterred, because their cause is righteous . . . .
Sderot today is what Berlin was in 1961, forty-five years ago: a test of will on the frontline of a new world conflict, emblematic of the competing values at stake. 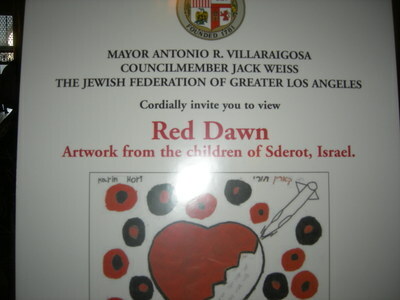 We are all citizens of Sderot, and these are our children. That's the Bush I voted for in 2004! Where did he go? Was Condi's brain eaten by State Department zombies, and then she ate Bush's brain? Are we going to throw the Afghanis and the Iraqis under the bus? She thinks “even Bush isn’t a Bush Conservative these days,” and wants someone to send her post to GWB “so he will remember who he is.” The post is worth reading in its entirety. There may be less enviable public speaking assignments than following Benjamin Netanyahu to the podium, but it is hard to think of them. Irwin Cotler, a member of the Canadian Parliament and former Minister of Justice, got that assignment -- giving the concluding speech to Monday’s plenary session of the UJC General Assembly in Los Angeles, speaking to the 3,000 member audience immediately after Netanyahu (who remained in the hall to listen to him) left the stage. And may I close with a metaphor with regard to “one people.” It came home to me while I was Minister of Justice. I think it is a metaphor that speaks profoundly to who we are. And it occurred in an encounter that I had with aboriginal, or native people, native law students, native Canadians. They came to me and with respect to our encounter they said “You know, Minister Cotler, we’re not just law students, we’re aboriginal law students. We come with a past, with a history, with a heritage; we come with a language, a culture, with an identity, we come with our own indigenous legal system. We’ve been dispossessed from all that. We’ve been dispossessed from our past, from our history, from our heritage; we’ve been dispossessed from our language, our culture, our identity. It’s not that we go to court because we want to nurture a grievance. We go to court because we want to rediscover who we are. We go to court because we want to reconnect to our roots. We go to court because we want to give expression to our own aboriginal legal system; and regrettably, whenever we do, we are confronted by a great deal of pain, because the Government of Canada doesn’t understand us -- the people of Canada don’t understand who we are." And I said “You know, let me share with you a parable that comes out of our tradition. Some Jews come to their rabbi and they say “Rabbi, you know we love you.” And the rabbi says, “Do you know what hurts me?” And they say, “Rabbi, why do you say ‘do we know what hurts you?’ -- we tell you we love you.” And the rabbi says “Because if you don’t know what hurts me, you can’t tell me you love me.” And I told them that is not only a profound principle of human relationships; it is a principle that we will try to express to you in our relationships with the aboriginal people of Canada. There is something about that -- that we are not just atomized people, atomized individuals. We are one people, with a common heritage and with a common destiny, and with values that underpin that common heritage and destiny, wherever we are. When we are concerned about Ahmadinejad’s genocidal speech it is because we have learned so well [Cotler first spoke the phrase in Hebrew], “life and death is on the tip of our tongue.” That is why we are cautioned against the whole question of "lashon hara" -- slanderous speech -- amongst us, in our community, which led to the destruction of the Temple. When we speak about [speaks the phrase in Hebrew], “do not stand by when your brother and sisters’ blood is being shed” -- that’s why we speak about the intervention in Darfur, the responsibility to protect doctrine, you know, at the UN and the Security Council [speaks in the phrase in Hebrew] -- we have to give expression to those cries. And this people, with one heart, with one head, with one destiny -- we should always remember that this people, this people has [speaks the phrase in Hebrew], “the rule of law” as our heritage, that has [speaks the phrase in Hebrew], the notion of Jewish humanitarian law, as our doctrine, that has “tzedek, tzedkek, haaort” -- “justice, justice, shall you pursue” -- as a moral imperative, that has “Shalom! Shalom!” -- “Peace, Peace” -- to those who are far, to those who are near, as our abiding hope, as our abiding dream, as our abiding will. And so I say, that this is why I say to this one people . . . [speaks the phrase in Hebrew], that a Jewish and just cause will prevail! 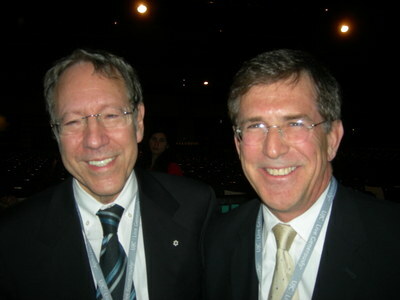 Cotler holds a Bachelor of Arts, a Bachelor of Civil Law, a Doctor of Laws, and a Ph.D, among other degrees and titles. He was a professor of law at McGill University and director of its Human Rights Program from 1973 until his election to Parliament in 1999 for the Liberal Party of Canada, and served as Canada’s Minister of Justice and Attorney General from 2003 until the 2006 election. He has been a visiting professor at Harvard Law School, a Woodrow Wilson Fellow at Yale Law School and is the recipient of five honorary doctorates. And he is a past president of the Canadian Jewish Congress. 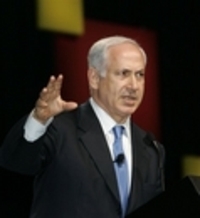 Netanyahu’s speech was a compelling warning of an existential threat. Cotler’s speech was an eloquent and impassioned statement of the reasons why survival is important, of what is at stake. Left to right: Irwin Cotler, PC , MP , OC , BA , BCL , LL.D , Ph.D, and a blogger. I want to add an ironic point to the coverage (here, here, here and here) of Benjamin Netanyahu’s eloquent speech this week before more than 3,000 people at the General Assembly of the United Jewish Communities in Los Angeles. There is time to act in a variety of ways, and all ways must be considered, and all ways that work must be employed, because we cannot let this thing happen again. Now to do this requires something that is particularly difficult. It requires what I call pre-emptive leadership. And of all the activities required in the political, economic and military fields, pre-emption is the most difficult. You can never prove to people what the situation would be if you do not move. . . .
All leadership exacts a cost -- because otherwise you don’t need leaders. You just need managers . . . you just run to the head of the herd. As it charges in one direction, you just charge along with it. Today what is required is leadership, leadership to change this tide of history, leadership to confront this danger -- leadership to act. . . .
For us the Jewish people, too many times in our history we didn’t see danger in time, and when we did, it was too late. Well, we see it now. . . . But can the world wake up? Can we wake up the world? Can we get the United States to act on its commitment -- a commitment made by President Bush -- he said we will not let Iran arm itself with nuclear weapons? Everybody in his right mind should support that position. It should be carried out. Can we get the world to do that? So where are we in this? Do we get it? Does the world get it? Do they think it will pass? We’re overstating it? We’re not. It’s 1938, Iran is Germany, and it is racing to acquire nuclear weapons. Today is the publication date of Jimmy Carter’s libel of Israel -- a book simultaneously sanctimonious and mean-spirited, uninformed and misinforming, an embarrassment not only to him and his party, but to all Americans. Unfortunately, anti-Israel groups do not care what is between the covers of this atrocious book. They care only that a former president has associated Israel with “apartheid” -- a moral capital crime. The “U.S. Campaign to End the Israeli Occupation” -- a group that describes itself as “a national coalition of more than 200 organizations” -- issued an “Action Alert” yesterday, noting it “has not reviewed an advance copy of the book,” but nevertheless urged members to call the media, and the party that will control Congress, to emphasize the one thing about the book that matters to the group: its title. Call your local talk radio programs and write a letter-to-the-editor to your local paper affirming that Israel's policies toward Palestinians are apartheid . . . . Send a message to your Members of Congress and the Democratic Party stating that you support President Carter's use of the term "apartheid" to describe Israel's policies. It will be important to watch how the media handles this. In the meantime, my attempt to help Truth get its boots on is here. “The analogy between apartheid and Israel is absurd. The revival of national sovereignty in the Jewish homeland is not a manifestation of European colonialism, in contrast to the white settlers (Afrikaans, English and others) who created Johannesburg and Pretoria. Jews are indigenous to the Middle East as is the Jewish national language, Hebrew. Anyone who has ever visited Israel knows that it is one of the most diverse multi-ethnic democracies in the world. SECOND UPDATE: Continue reading here.